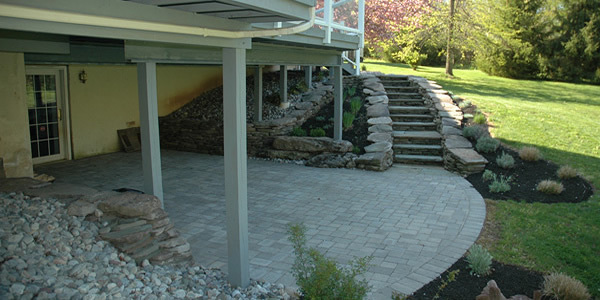 Natural stone and pavers are a fine combination, as long as the colors of the materials are similar or complementary. Even adding a wood deck to the mix looks appropriate- with a similar color scheme. The EP Henry pavers in pewter blend, irregular bluestone in grays and blues, and the PA fieldstone in grays and browns combine to create a natural appearance. The wood deck stained in gray blends with the other materials. Don’t be afraid to mix materials for your landscape projects. Our service area includes all of Bucks County and Montgomery County, PA including Upper Makefield, New Hope, Solebury, Buckingham, Newtown, Doylestown, Yardley, Lower Makefield, Wrightstown, Perkasie, Chalfont, New Britain, Hilltown, Point Pleasant, Tinicum, Springfield, Quakertown, Blue Bell, Ambler, Lower Merion, Upper Merion, Upper Gwynedd, Bryn Mawr, Spring House, and Skippack.